A lack of material news did not prevent the market from posting new gains. 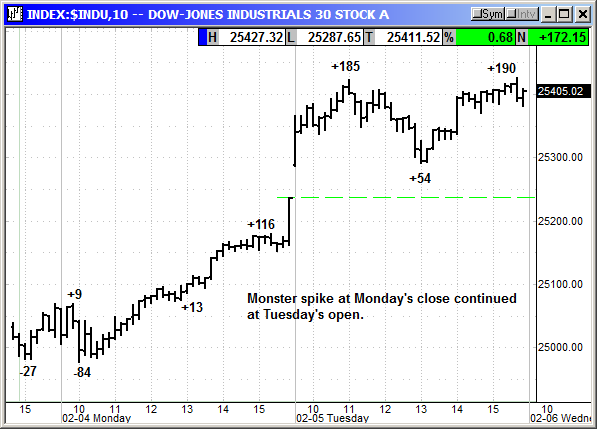 The monster spike at Monday's close continued at Tuesday's open and topped out around +185 at 11:AM. 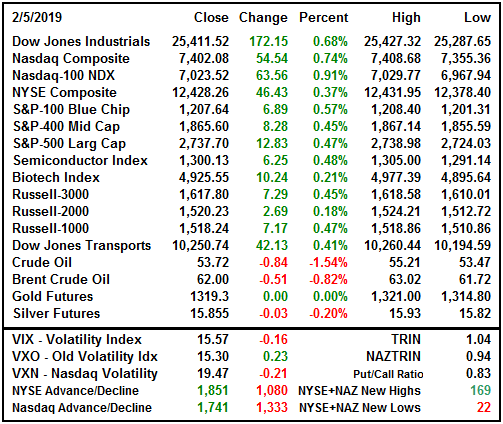 The buying paused as a minor sell program hit at noon, but dip buyers were ready to jump in and the Dow quickly recovered. The 25,400-level appeared as resistance and tomorrow's market will be dependent on what is said, or not said, in the State of the Union. With infrastructure spending on everyone's mind that could be a highlight. Unfortunately, a drug pricing program to lower drug costs would be market negative. There were only a couple economic reports and only one that mattered. 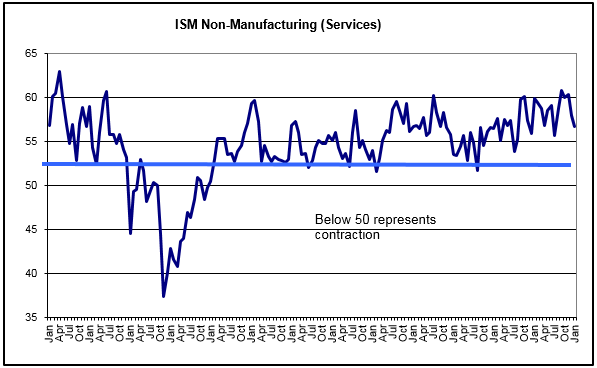 The ISM Services for January declined slightly from 58.0 to 56.7. This is still in expansion territory but down from the peak at 60.8 back in September. New orders declined from 62.7 to 57.7 but backorders rose slightly from 50.5 to 52.5. Inventories declined from 51.5 to 49.0 indicating the need to stock up. Employment improved slightly from 56.6 to 57.8. Activity was mixed with nine industries reporting growth and eight noting a decline. Multiple survey respondents mentioned the impact from the government shutdown so this indicator will probably rebound in February. The CoreLogic home price index declined from 5.1% to 4.7% price growth over the trailing 12 months. That is the lowest price appreciation since late 2012. Single family home prices rose only 0.1% for the month overall. Prices in Los Angeles, Chicago and Riverside declined while Philadelphia prices rose 0.7% and New York prices rose 0.6%. On a trailing 12-month basis Idaho prices were up 11.7%, Nevada 10.8% and Utah 8.7%. Las Vegas was the hottest city with a 11.3% increase and Chicago was the lowest at 2.5% for the year. Rising interest rates are taking a toll on home buyers leading to slower appreciation of prices. 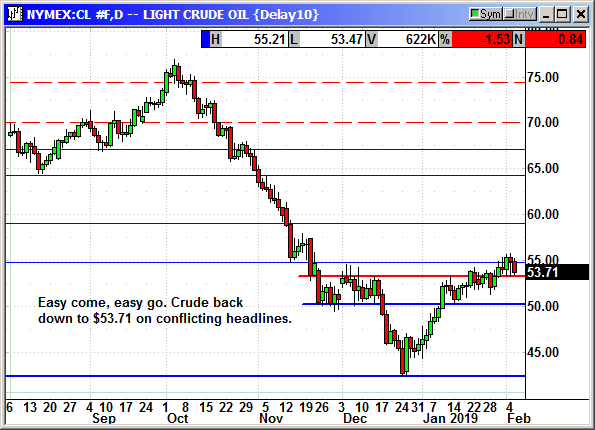 The weekly API crude inventories showed a gain of 2.5 million barrels and only slightly more than estimates. Gasoline inventories rose 1.7 million barrels and distillates rose 1.14 million. Prices declined unexpectedly despite OPEC saying it wanted to align itself with the ten-nation group led by Russia in order to better manage global prices. That sounds like price fixing at a higher level to me, but prices went down. The biggest headline for the rest of the week is the Powell speech on Wednesday. Powell had dinner with Trump this week and supposedly they did not talk about Fed policy but the economy in general. It will be interesting to see if Trump mentions it in the SOTU tonight or Powell mentions it on Wednesday. The earnings calendar is busy but there are no market moving reports due out for the rest of the week. Chipotle Mexican, Lilly and Match.com will probably generate the most headlines. GoPro is no longer relevant and will probably be ignored. Unfortunately, the earnings forecast for the S&P for Q1 turned negative today. It is only a decline of -0.1% but that is down from a rise of +8.0% just a couple weeks ago. This is not enough to tank the market, but we are moving in that direction. A decline of 3-5% would force investors to pay attention. It was a rather lackluster day for earnings and news. 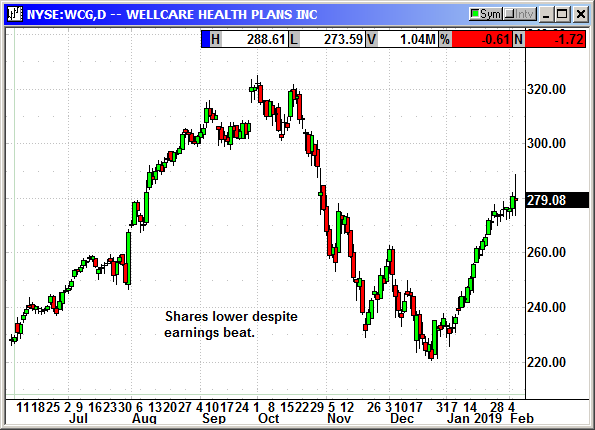 WellCare Health Plans (WCG) reported earnings of $1.63 that beat estimates for $1.55. Revenue of $6.07 billion beat estimates by nearly 4% but was up significantly from the $4.35 billion in the year ago quarter. They ended the year with 5.4 million members. They tripled their membership in December when they acquired Aetna's Medicare Part D drug plans. Shares have rebounded sharply from the Q4 decline but they lost $1.72 today. 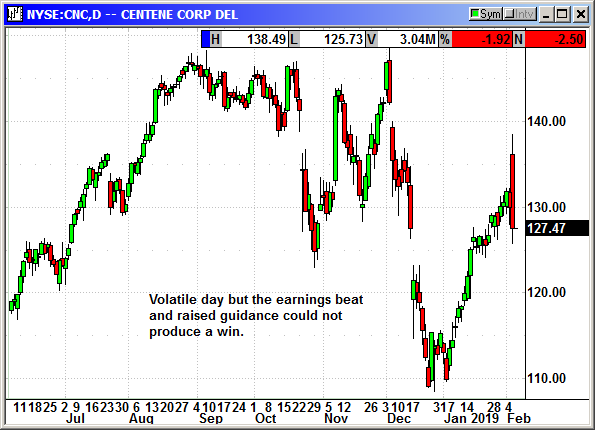 Centene (CNC) reported earnings of $1.38 that beat estimates for $1.33. Revenue of $16.56 billion rose 27% and beat estimates of $16.2 billion. They guided for 2019 for $8.22-$8.62 and that was up from prior guidance of $8.15-$8.55. Analysts were expecting $8.37. Revenue guidance rose to $70.3-$71.1 billion. Shares traded in a $13 range before settling to lose $2.50 at the close. 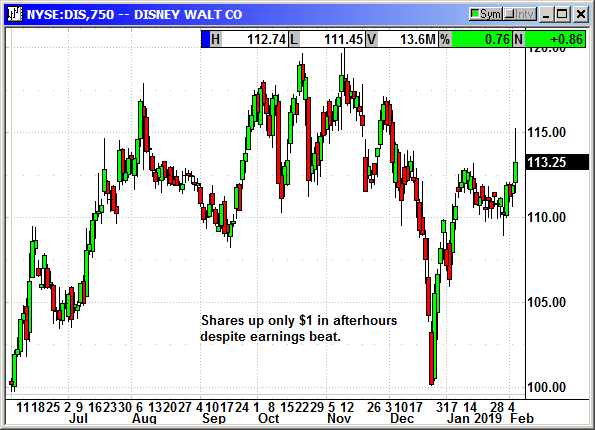 After the bell Dow component Disney (DIS) reported earnings of $1.84 that beat estimates for $1.55. Revenue of $15.30 billion beat estimates for $15.14 billion. A 40% jump in revenue at ABC helped to power the earnings beat. That came from affiliate fees, advertising revenue and program sales. Theme parks reported a profit of $2.2 billion, a 10% increase from the year ago quarter. Profits came from increased attendance and higher per capita spending. Disney has signed up two million paying customers for its streaming service, but they are still losing money. They added 600,000 subscribers ahead of the first UFC Fight Night broadcast. Disney is not going to allow Netflix to stream Captain Marvel in hopes that will attract customers to the Disney platform. Movie studio profits fell -$309 million after Mary Poppins Returns failed to attract audiences. That release was fighting comps from the Last Jedi in the year ago quarter. Disney is buying assets from Fox and will end up with a majority stake in Hulu. They will add that to their streaming division with Iger saying families will have more than one streaming service. He called 2019 a "transformational" year. Shares gained $1 in afterhours. 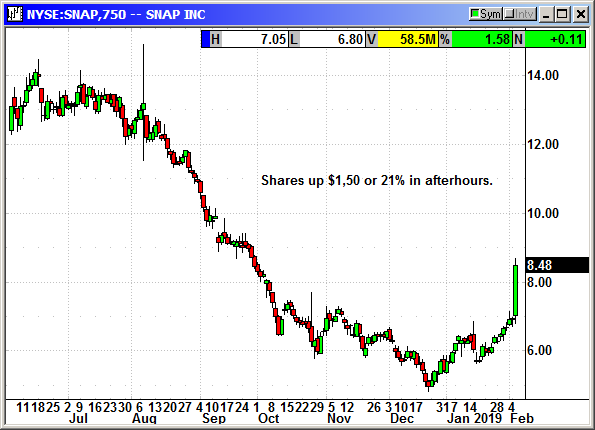 Snap Inc (SNAP) posted a loss of 4 cents that beat estimates for a loss of 19 cents. Revenue soared from $285.7 million to $389.8 million and analysts were expecting $377.2 million. They guided for a loss of $140-$165 million in Q2 on revenue of $285-$310 million. Analysts were expecting a $170.6 million loss on $299.5 million. The company finished the quarter with 186 million active users and average revenue per user of $2.09. Analysts had expected 184.3 million and $2.05 per user. Unfortunately, SNAP had 191 million users in the year ago quarter, so these results show a small decline. Revenue per user in 2018 was only $1.53 so that metric rose by 35%. The company has a goal of being profitable by the end of 2019. Shares rallied $1.50 (21%) in afterhours. All the earnings after hours were not positive. 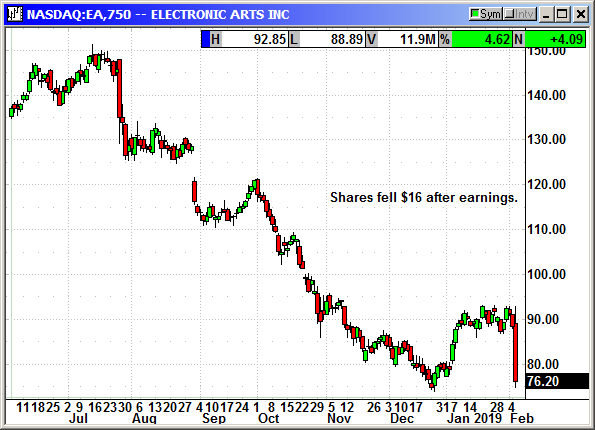 Electronic Arts (EA) reported earnings of $2.30 that beat estimates for $1.94. Revenue of $1.29 billion missed estimates of $1.75 billion by a mile. Bookings fell from $1.97 billion to $1.61 billion and that also missed estimates for $1.76 billion. For the current quarter they guided for 56 cents on revenue of $1.16 billion. Analysts were expecting $1.58 (OUCH) on revenue of $1.48 billion. Shares fell $16 in afterhours. 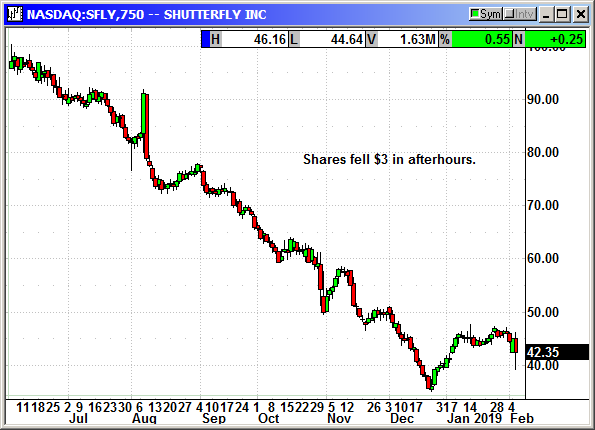 Shutterfly (SFLY) reported earnings of $5.19 that beat estimates for $5.12. Revenue rose sharply from $594 million to $950 million but still missed estimates for $952 million. That is a monster jump so obviously analysts were a little over anxious in their estimates. The company said the CEO was leaving and the board had formed a search committee and hired a search firm for his replacement. They also disclosed they had been approached by a third party about an acquisition and subsequently engaged with other third parties, but no proposals have been received. They have formed a strategic review committee to consider any potential offers. Given the multiple interested parties and earnings beat, I am surprised the stock declined $3 in afterhours. 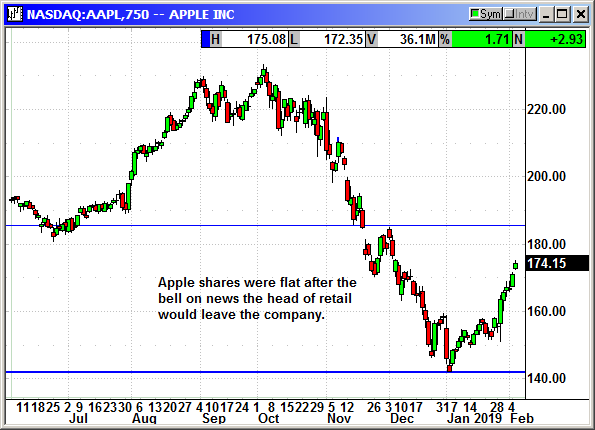 Apple (AAPL) shares were flat after the announcement Angela Ahrendts, the head of retail marketing, would leave the company. Deirdre O'Brien, currently senior vice president of People would add Retail to her title. She has been with Apple since 1988. That suggests she is a very wealthy person and must really enjoy her job. Thirty years of stock options would be a fortune. Apple shares are up $32 since Christmas and $20 since their earnings on January 30th. 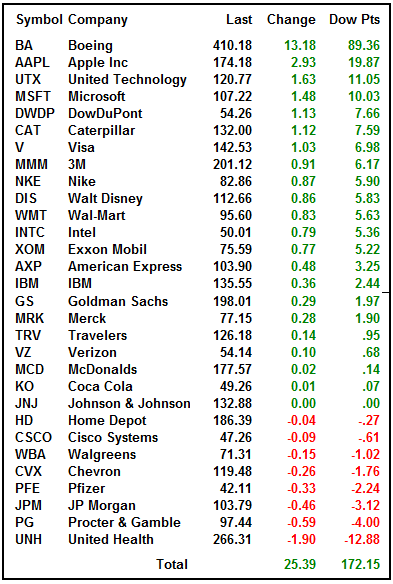 Boeing (BA) continues to be the leader on the Dow. The stock added $13 today alone after Bernstein reiterated an outperform rating and raised their price target from $435 to $459. UBS has the highest target at $515. In addition, the company said it was partnering with Aerion to produce a next-generation supersonic aircraft. The terms of the deal were not disclosed but it consisted of Boeing making a sizeable investment into Aerion to accelerate technology development and aircraft design. Boeing will provide engineering, manufacturing and flight test resources with the goal of bringing a test flight in 2023. The target is 1,000 mph or Mach 1.4. Aerion was founded in 2003 and introduced its first supersonic 12-passenger business jet design in 2014. They unveiled a new supersonic engine called the GE Affinity design in 2018. In other news Boeing is pushing to raise its production rate on the 737 from 52 to 57 per month in June. These are its best-selling planes and list prices are between $85.8 million and $129.9 million. Boeing production had been held up by slow engine production at CFM International in France. That bottleneck has been resolved by shifting some parts of the supply chain to other suppliers. Boeing had been a laggard in Q4 on worries over the trade war with China. Investors were afraid they would become a tariff target. Apparently, that is no longer a worry. If we did get a post deal decline it could be well back to $370. 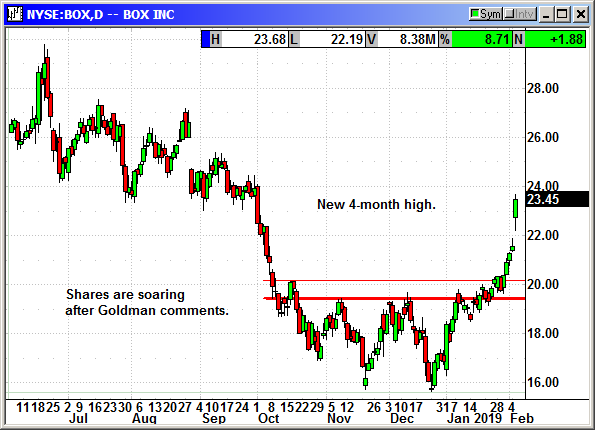 Shares of Box Inc (BOX) surged 9% to $23.45 after Goldman initiated coverage with a buy rating and $31 price target. Goldman said, "We view Box as one of the best positioned vendors in cloud content management, taking advantage of the shift in enterprise content management to the cloud as well as the unification of enterprise content management with enterprise file sync and share." The analyst said, "Box is exiting a transition period that lasted for the past year and caused the company to modify its sales process." Bookings are expected to accelerate throughout 2019. Investors do not appear to be concerned about current overbought conditions, declining earnings or the potential for the end of February meeting between Trump and Xi to turn into a disaster. Dips are being bought, bad earnings are being shrugged off after a couple days of declines and the markets are moving higher. Markets love to climb a wall of worry until a brick unexpectedly breaks to leave them unsupported. I personally think that brick will be the declining earnings but the China trade meeting at the end of February is also going to be a challenge. Even if everything goes right, it could turn into a sell the news event because of the weeks of market gains. Goldman Sachs said today that anyone who missed the January rally missed the gains for the year. They are not projecting doom and gloom. They simply believe that further gains will be modest because of the decline in earnings. After the worst December since the Great Depression and the best January in 30 years, they expect only modest returns on equities for the rest of the year. Their year end target for the S&P is 3,000, which would be another 10% from here. That is not too shabby given the 9% the indexes gained in January. Then believe earnings will rise only 4% in 2019 and 2% in 2020. That is a dreary forecast given the 22%-24% gains throughout 2018. 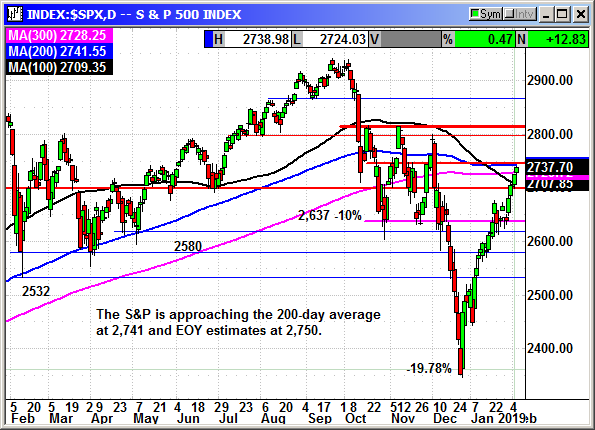 The S&P gained 14 points today to pull ever so close to the 200-day average at 2,741. Analysts believe that will be a struggle to overcome. If we could get some unexpectedly positive headline out of the SOTU tonight to catapult us over that level it would be very beneficial. The year-end analyst consensus for the S&P is 2,750 and we are only about 10 points away. That is also expected to be a psychological hurdle. Thank you, Boeing. This stock has added 312 points to the Dow since January 29th. Without Boeing dragging the index higher the Dow might still be under 25,000. This is the benefit of a narrow price weighted index. When one large stock catches fire, the index explodes higher. 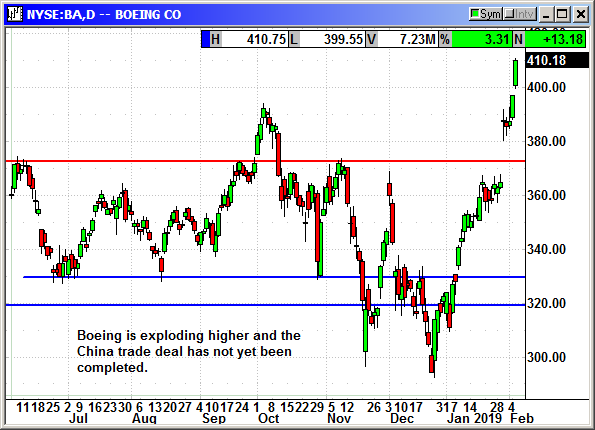 Of course, when Boeing finally cools, the index will suffer. 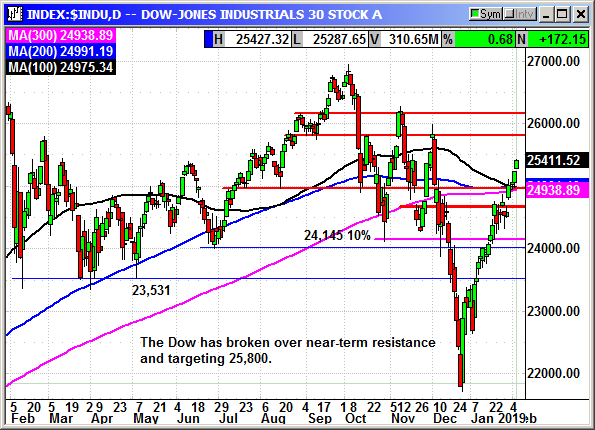 For today, we celebrate with the Dow having broken out from clustered resistance and now having an unobstructed path to 25,800 and early December resistance. 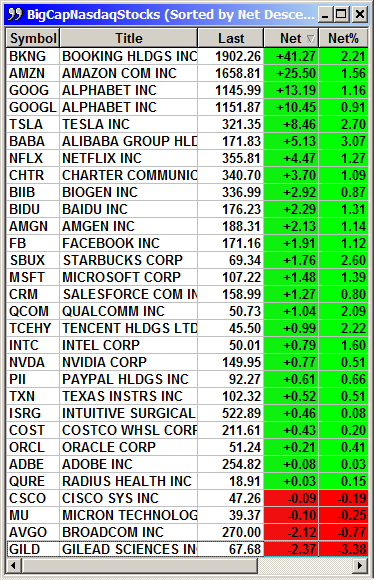 Google's pain was short lived, and they are back on the top of the Nasdaq leader board. Amazon also found some traction and shook off two days of losses. 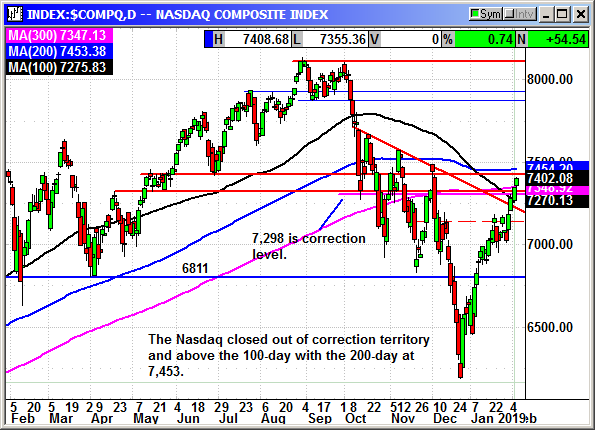 The Nasdaq is approaching the 200-day at 7,454 and a break over that level gives the index a clear shot at the October highs. I can't believe I am actually writing that with earnings growth turning negative. I am not holding my breath, but bullish momentum is a powerful force. 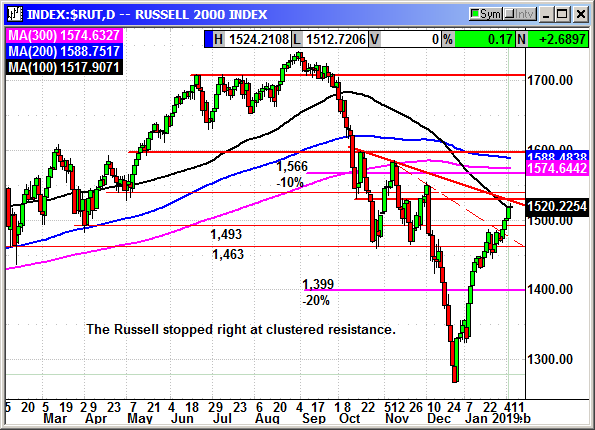 The Russel 2000 was the weak link with less than a $3 gain while the big caps indexes were surging. This could be the result of event risk fears on the topic of drug pricing in the SOTU. Lots of resistance ahead. While I may be concerned about the market's immediate future, I am still not recommending any sells. The trend is our friend, until it ends. Just keep those stops tight and expect the potential for trouble after expiration Friday and after the China trade meeting.